Citation: C N Trueman "James I and Royal Revenue"
James I has always been viewed as an extravagant king who gave no thought to finance – if James wanted something, he had it regardless of cost. When James became king in 1603, he described himself as being “like a poor man wandering about forty years in a wilderness and barren soil, and now arrived at the land of promise.” James’s time as king of Scotland had been spartan in terms of creature comforts when compared to the lifestyle of English noblemen. When James moved south from Holyrood to London in 1603, he was greatly impressed by the lavish entertainment put on for his benefit by various noble families. James concluded that he could expect even better after he was crowned as a king, as by rights, he would be able to live a far grander lifestyle than noble families. James believed that all royalty should have a lifestyle based around magnificence and majesty and that the resources of the state should provide whatever was necessary in terms of cost. James also believed that his family had the right to live in similar magnificence. Royal finances under Elizabeth had effectively oriented around one person as the queen never married. However, with a wife and children, the first Stuart royal family in England was likely to cost a great deal more to support than Elizabeth. Prince Henry alone had £25,000 a year put aside for expenditure solely on him. After decades of female rule, James decided that the royal wardrobe had to be suitably changed for a man – hence the increase in expenditure on royal clothing from £10,000 in 1603 to £36,000 in 1610. James believed in royal magnificence and this included treating his favourites. His early favourites were Viscount Haddington, Lord Hay and the Earl of Montgomery. James considered it perfectly acceptable to pay off their debts using his own revenue before paying off his own debts. This is what happened in 1607 when James paid off the debts of all three men at a cost of £44,000. Robert Carr had been a page to James in the Scottish royal court. He had come to London as a member of the Hay household. However, he had very little money and James decided to change this. The favourite of the king had to have a suitable standing in society and that included property. James could not hand out crown land as these had been entailed. In solving this problem, he was helped by his Chief Minister Robert Cecil. 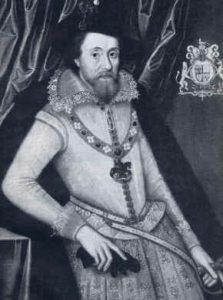 He suggested to the king that the manor and land at Sherbourne could be handed over to Carr as it had belonged to the imprisoned Sir Walter Raleigh. The explorer’s attempt to keep Sherbourne Castle for his wife via trustees was found to be legally flawed. James followed Cecil’s advice and the estate was handed over to Carr with the resultant increase in his social standing. James’s extravagance was bound to cause anger when it is considered that the bulk of his generosity assisted those from Scotland who had travelled to London with the new king. By 1610, nearly £90,000 had been given to Scots in gifts and another £10,000 paid out in pensions. In an average year, Scottish followers based in the royal court received £40,000 in total while their English equivalents received £10,000. It could be argued that those Englishmen needed a royal handout a lot less than their Scottish counterparts because of their extra wealth – but it did cause antagonism in the royal court. However, to maintain a balance, all major government and administrative positions – with the power and rewards these held – went to Englishmen and James reminded Parliament of this in 1610. Regardless of this, and despite the fairness in James’s logic, there were many in the House of Commons who found the argument hard to accept. James did admit that he had been far too extravagant in the first three years of his reign and he did promise Parliament that the days of heavy spending were over when he addressed them in 1610 – the year of the attempted Great Contract. He excused his behaviour by stating that the sheer excitement of coming from a relatively poor background – when compared to the English royal family – into one of seemingly huge wealth had been too much for him to control himself. James even promised Cecil that he would curb his spending once it became apparent to him, that his wealth was not as great as he had thought. Cecil, for his part did support the king’s right to be ‘bounteous’ as a king or queen was expected to exude magnificence and as Chief Minister, he told Parliament that the people of England expected their king to be magnificent otherwise they would exist in a “miserable climate”. While James promised to curb his spending, he also ordered those who worked for him to maximise his revenue to enable him to be ‘bounteous’. James did admit that he had been far too extravagent in the first few years of his reign and he did promise Parliament that the days of heavy spending were over when he addressed them in 1610 – the year of the Great Contract. James excused his behaviour and explained that it was out of excitement at moving from the relative poverty of the Scottish crown to the expected riches of the English throne. However, while promising to reduce his spending, he told the royal court that he wanted to maximise the revenue he collected to enable him to be ‘bounteous’. Cecil, though highly concerned at royal finance also expressed his belief that a king sholud live in magnificence.